There are a lot of strong opinions out there about how to grill corn. 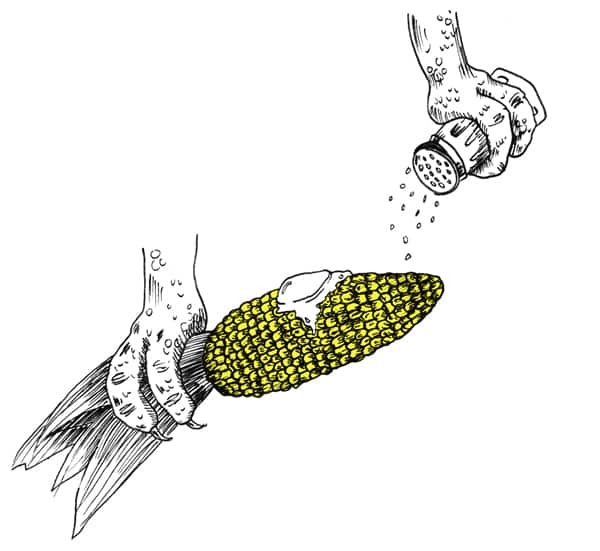 Some people insist on shucking the corn first to get those nice grill marks right on the cob; others prefer leaving the corn unpeeled so it steams while cooking. I’ve tried just about every method, but once I stumbled upon this one, there was no going back. It’s a nice happy medium between shucking the corn and keeping the husks intact — you peel off a few layers of leaves, but leave the rest on. Once you’ve had grilled corn, you’ll never want to eat it any other way! Preheat your grill to medium high, about 400°F. While the grill heats, prep your corn. All you do is peel off the outer two or three leaves of the husk. And you’re prepped! So easy, right? Place the corn directly on the grill and close the lid if your barbecue has one. Cook your cobs, opening the lid to turn occasionally with some nice long tongs, until the husks are blackened in spots and steaming — about 15 minutes. Remove the cobs from the grill and let them cool enough to handle, about 5 minutes. Once the corn has cooled, peel back the husk, pull off the silky strands, and discard them — they’ll come off easily because the corn is nicely steamed. You can leave the peeled-back husk on to use as a handle (it’s a little messy but worth it! ), or simply cut it off. And that’s it! All that’s left to do is dress it up the way you like it — I like the typical smear of butter along with a couple of dashes of salt and pepper, but you can dress up your corn with all kinds of herbs and spices, hot sauce, or grated cheese. And then, of course, devour. This is one of the best things ever, hands down! I love grilled corn and just about any grilled veggie! All tutorials should include a t-rex. This is fantastic. This made my morning! 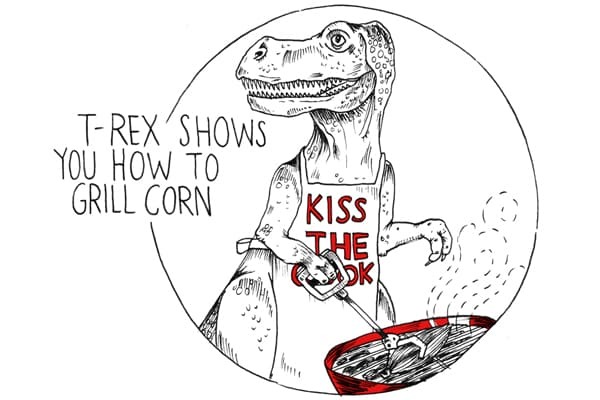 Love these drawings – go t-rex!! Wow I never knew I could learn how to grill from a dinosaur. My kids love to eat corn but I never grill it so it’s time to spice it up! Dinosaurs are so smart! Plus I never knew T-Rex’s were omnivores AND good cooks—that T-Rex should write a cookbook, I want to know more!